When we think of hot tubs, many times relaxation, therapy, and good times with family and friends are the things that come to mind. Indeed, hot tubs are great for kicking back with friends, relaxing after work, or soothing muscles after a workout, but is there more? Let’s explore. Sure, athletes might use a hot tub to ease muscle aches and recover. However, there’s another great use for spas. Athletes, and everybody else for that matter, can actually use a hot tub in another interesting way: exercising in the spa. That’s right, exercising is one more way to enjoy and get great use out of your time in a hot tub. Actually, exercising in water can offer several advantages over conventional exercise. An important part of staying healthy is regular exercise. Different kinds of exercise, like jogging or weight lifting, can increase stamina and cardiovascular health or build strength in specific muscle groups. But conventional exercises have a downside. They are often hard on joints. Running, for example, can really wear out knees and ankles. Every time your foot hits the pavement or track, shock is transferred up and absorbed by the ankles, shins, knees, and hips. In moderation, this probably won’t cause much trouble. Over long periods of time, or in cases of pre-existing joint pain, running can really hurt those bones. Water exercise, though, doesn’t hurt the joints at all. There is no hard ground to pound your foot and no jarring shocks to your joints. You get the same cardio workout, but no joint stress. Sometimes pre-existing conditions or old injuries make exercise more painful than it should be. Arthritis, especially in older people, can make lifting weights or walking very painful. Muscular injuries like pulls or sprains prevent full range of motion and cause pain during exercise. People suffering from this kind of condition may find hot tub exercise a much better alternative. Submersion in water applies gentle pressure to the entire surface of the body, created by the body’s buoyancy and water pressure. This pressure floats the body and relieves muscle and bone pain by helping take the strain off of injured bones or muscles. If you have bone or muscle pain when lifting weights (even light weights), try doing it in a hot tub instead. The soothing heat and water pressure may be the perfect combination to make exercise enjoyable again! The most important advantage to exercise in a hot tub is that it’s in a hot tub! 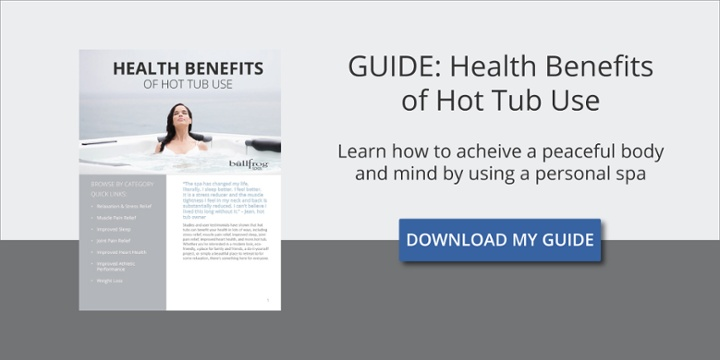 Hot tubs are fun and relaxing, so you’re bound to exercise longer and more often. Friends or family may be hesitant to hit the gym with you, but they’re sure to love joining in on a hot tub exercise session!